The first fully assembled CODA – a silver all-electric sedan with a 31 kWh battery pack – to be sold to consumers has driven off the final assembly line. 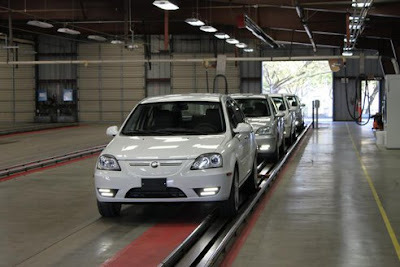 The momentous occasion officially kicked-off the final assembly of CODA Automotive's first all-electric 2012 CODA five passenger sedans that will be sold in California – ultimately to current reservation holders. "This is an incredibly exciting day for the CODA family and the EV community," said Mac Heller, executive chairman, CODA Holdings. "Since day one, we've been dedicated to designing an electric car that provides the amenities that the American driver has come to expect, such as range, torque, and value. This car symbolizes our commitment to accelerating the adoption of EVs." The all-electric car company continues to support the growth of green jobs in Northern California as it conducts the final assembly – including the installation of the vehicle's central powertrain unit and other electrical components, and a robust vehicle safety and quality inspection – at a facility located approximately 30 miles from San Francisco. With the initial assembly of the glider chassis and Lithium-ion battery pack conducted in China, all research and design, marketing and sales are conducted at the company's global headquarters in Los Angeles. The CODA will be soon available for purchase at dealerships throughout California: CODA of Silicon Valley, run by Del Grande Dealer Group (DGDG in Northern California; Marvin K. Brown Auto Center in San Diego; and various locations in the Los Angeles region that will be announced soon. As production increases, additional dealerships in the state and beyond will be announced.